You might know me as the interpretive naturalist that lives and works within the cozy valley formed by your majestic granite walls. Working as a naturalist has been my dream job ever since I was a small child, because you stole my heart at an age that seems so far away now. Though I was 19 years old when I first stepped foot on your precious soil, I have dreamt of you ever since I was capable of dreaming. Tears streamed down my freckled face when I first laid eyes upon your heart, and the waterfalls that pour from it. You warm my soul with each breath I take of your fresh air. 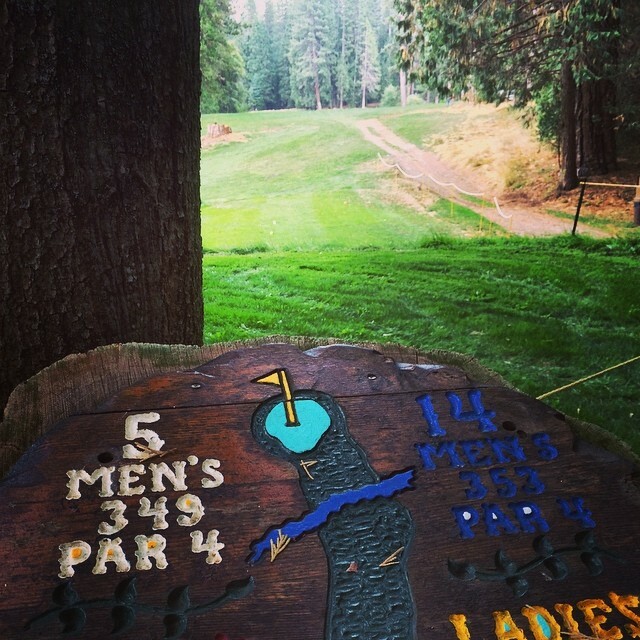 Your assortment of wild-flowers, woody shrubs, mushrooms, and trees keep me grinnin’ all day long! Your wild raspberries nourish my happy little body each morning, afternoon, and night. I have never known wild berries to taste so good, so sweet, and so fresh. Maybe it is all the love your treasured soil contains. Or maybe it is because you are just pure magic. My dearest Yosemite, why are you so good to me? 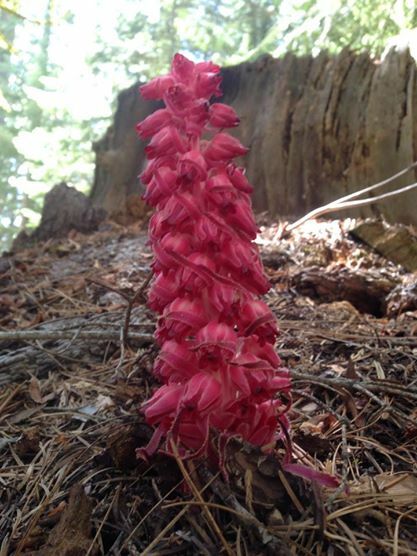 Raspberries, an amazing individual within the rose family, Rosaceae Rubus, grow wild and free; and on my naturalist strolls through the Ahwahnee meadow, park visitors who explore your lands are able to bask in their beauty, sweet aroma, and indescribably wonderful taste! My dear Yosemite, your wild raspberries, Rosaceae Rubus leucodermis, keep all of us sustained and invigorated, as our fingers stain purple and red while picking your delicious little treats. My goodness Yosemite, you make me want to steal away to your green meadows and river shores, for we humans are so eagerly interested in everything alive. On my naturalist strolls, we swim in all that is alive, we taste it, we see it, we understand and delve in every aspect of your beauty. And it does not stop there! 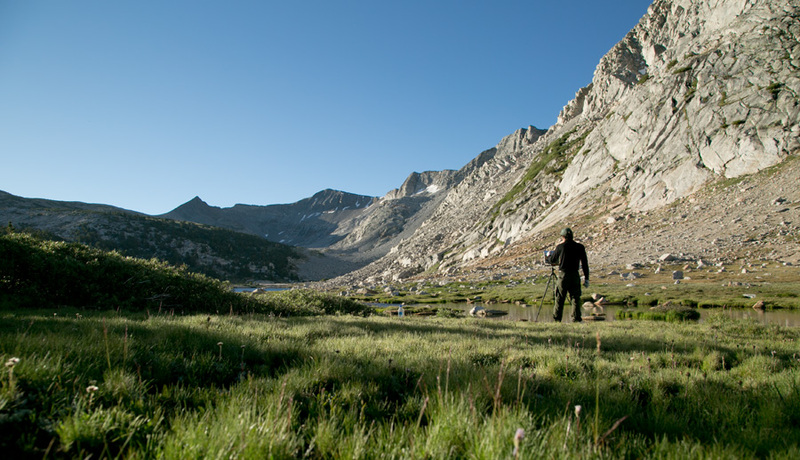 You have so many wild and untouched horizons upon your majestic lands. 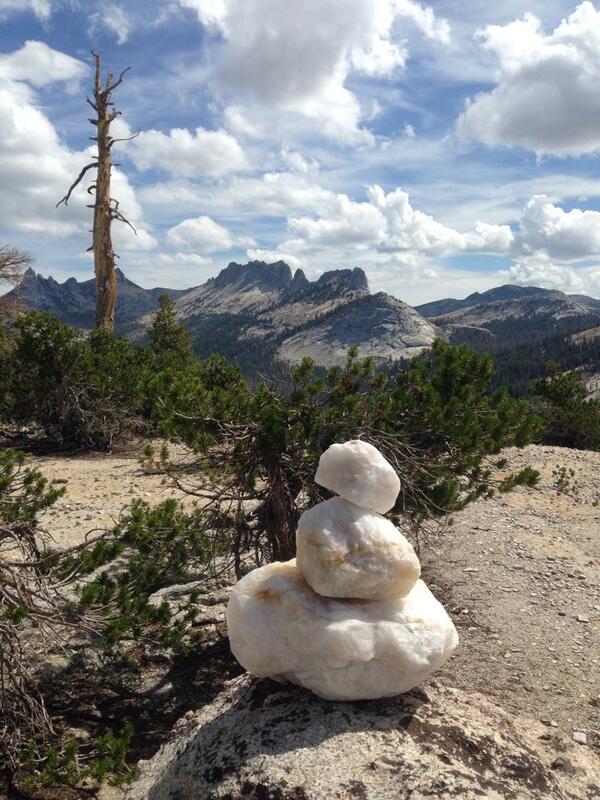 Tuolumne transformed the carbon compounds that make up my body the first day I saw its glory: open meadows untouched by human toes, gnarled peaks that touch the sky like spines on a dragon’s back, and gaping mountain mouths that reach out toward the heavens. 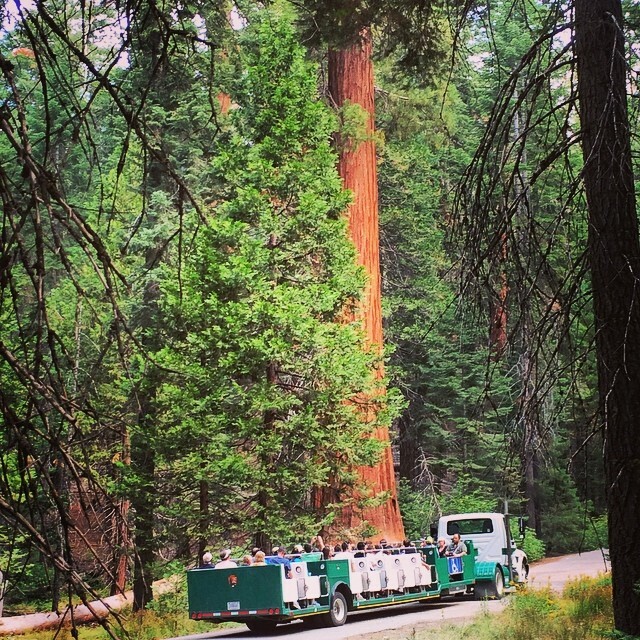 Tuolumne is a whole other world: one that cannot be described by mere words. Before you opened my eyes to the immeasurable beauty of open lands I was lost, but now, you have shown me true life, true freedom, and true happiness. I have finally found that our spirits need wilderness to breathe. Thank you Yosemite. Thank you so much, for everything. 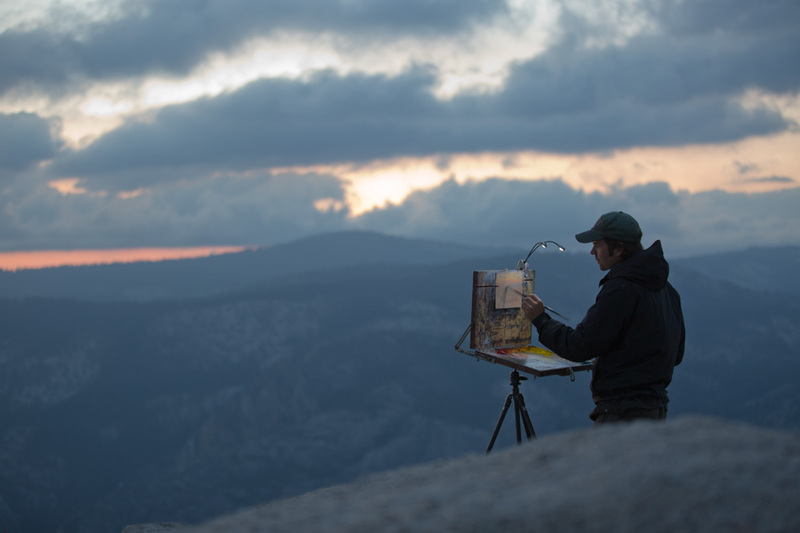 Have you discovered your passion within Yosemite? 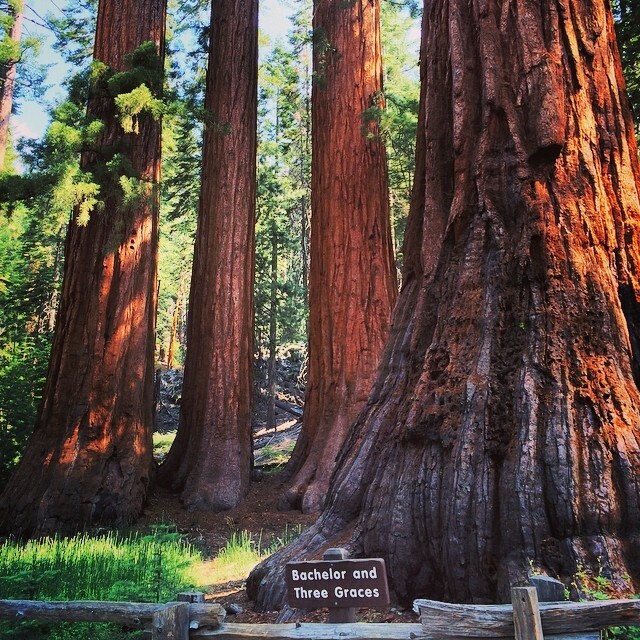 Join a DNC Naturalist to learn more about Yosemite National Park and uncover more of its beauty! 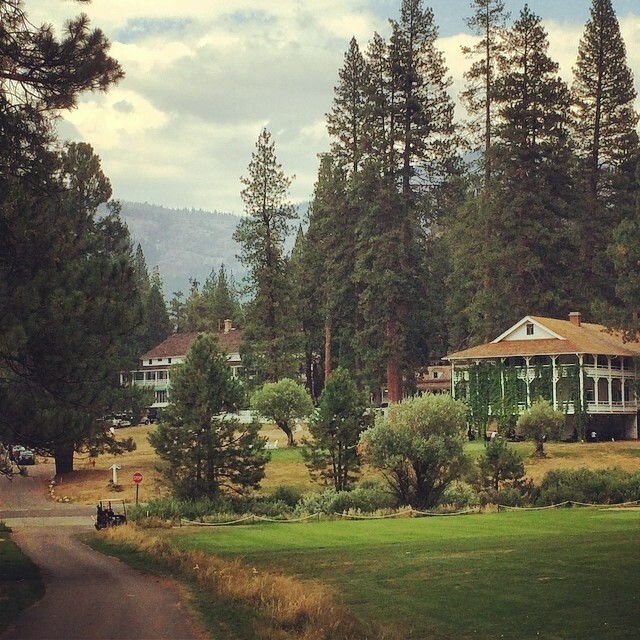 In addition to being situated in one of the most picturesque landscapes on earth and designated as a National Historic Landmark, The Ahwahnee also boasts an amazing art collection that complements the architecture of the hotel. 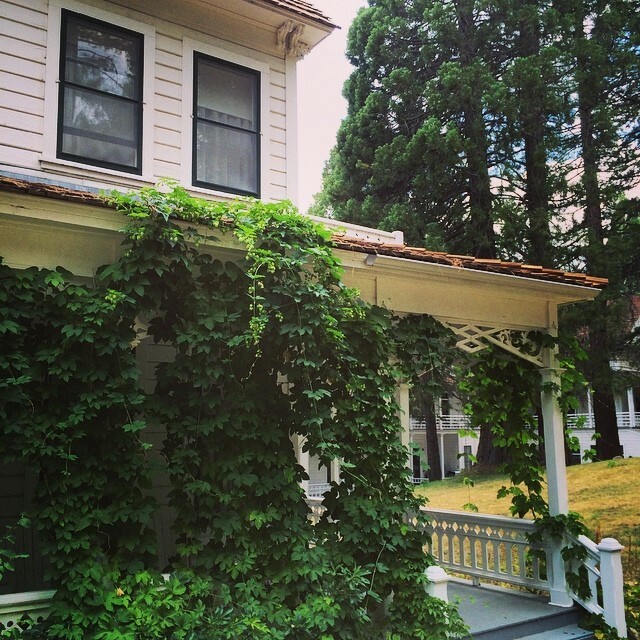 Did you know that The Ahwahnee displays one of the greatest Persian rug collections in the world? Though the design motifs found throughout the hotel are inspired by Native American patterns, the geometric patterns found in kilims, soumaks, kalamkars and other Middle Eastern rugs blend in seamlessly. 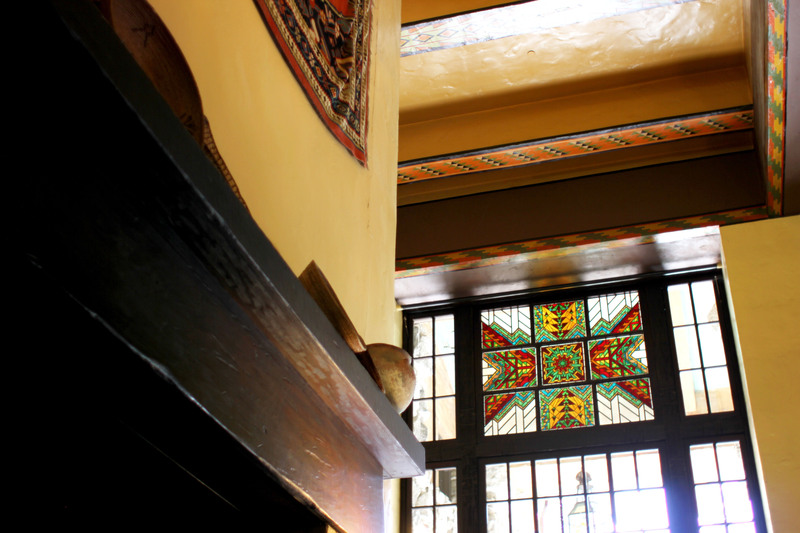 The hotel’s original decorators – Dr. Phyllis Ackerman and Dr. Arthur Upham Pope – were experts in Persian arts and selected a variety of Persian rugs for the hotel’s public spaces since there wasn’t enough time before the grand opening to have Navajo rugs created. 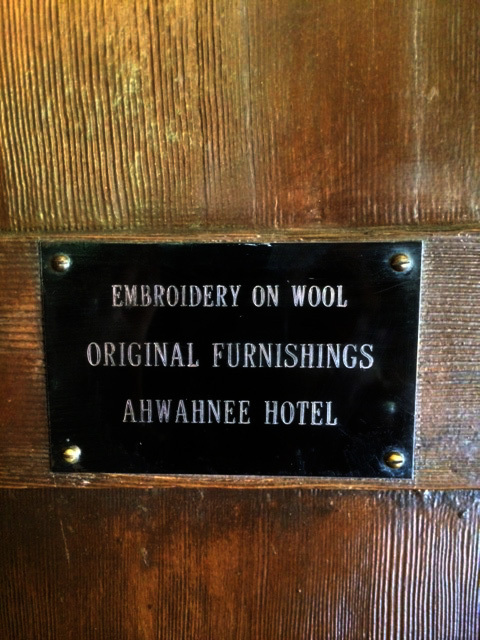 The Ahwahnee required fifty-nine rugs in total at opening and they were purchased in New York in 1927, ranging in price from 48.75 to $93.75 for a total of $5659. 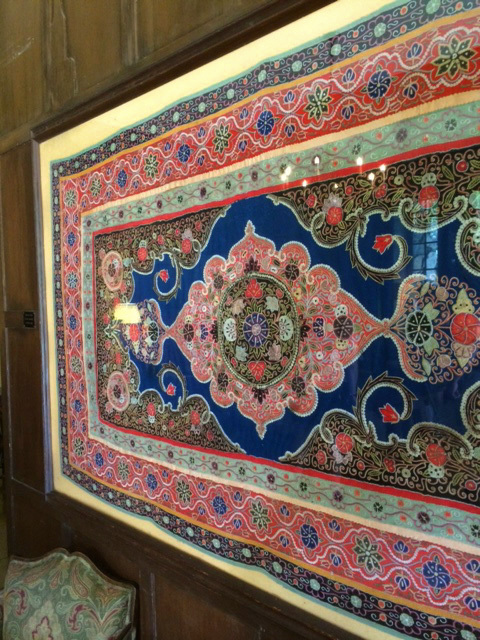 Today, many of the original rugs are displayed in the hotel’s public spaces mounted on the walls. Some are fully framed and the remnants of others are framed that proved too fragile over time. Persian rug from the hotel’s original decor on display in the Mural Room. The geometric patterns found in the rugs also inspired six art deco mosaic floor designs created by Henry Temple Howard with a special patent-pending process that combined linoleum, cork, clay, sawdust and linseed oil. Referred to as “rubber tile”, the mosaic designs were based on basket patterns from the Yurok, Hupa and Pomo tribes of California. 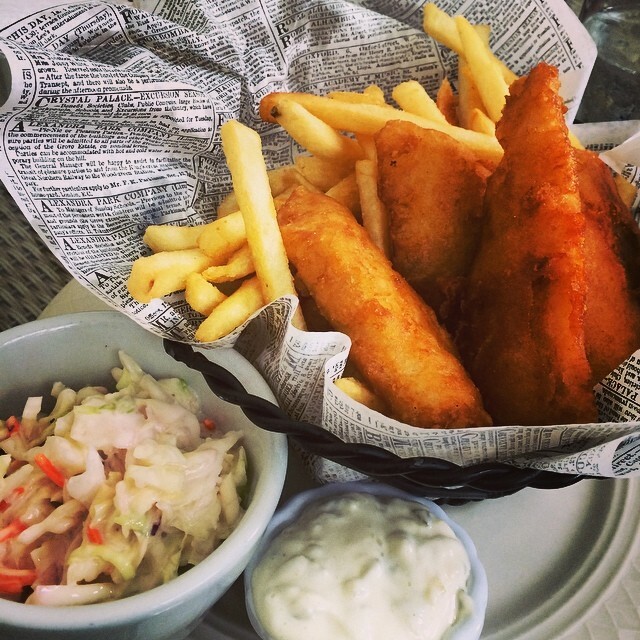 Baskets and basket patterns are prominently displayed throughout the hotel to this day. U.C. Berkeley graduate Jeannette Dyer Spencer created the striking basket mural above the fireplace in the elevator lobby and the equally colorful stencil patterns found on the walls and ceilings throughout the hotel. Spencer made such a great impression with her work that she was hired permanently as the hotel’s interior decorator after the opening of the hotel on July 14, 1927. 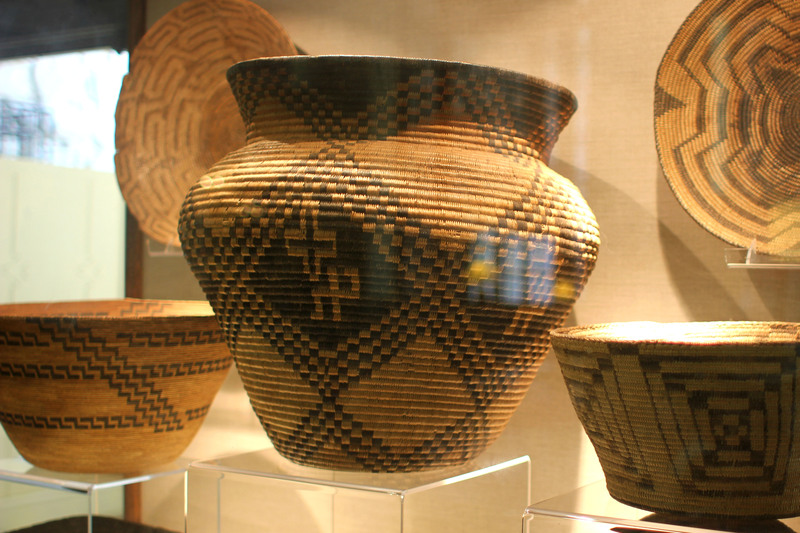 The baskets currently on display in the Great Lounge represent the basket artistry of California tribes such as Miwok, Pomo, Mono, Hupa and Yokuts, and another Native American tribe is also represented by the Pima of Arizona. 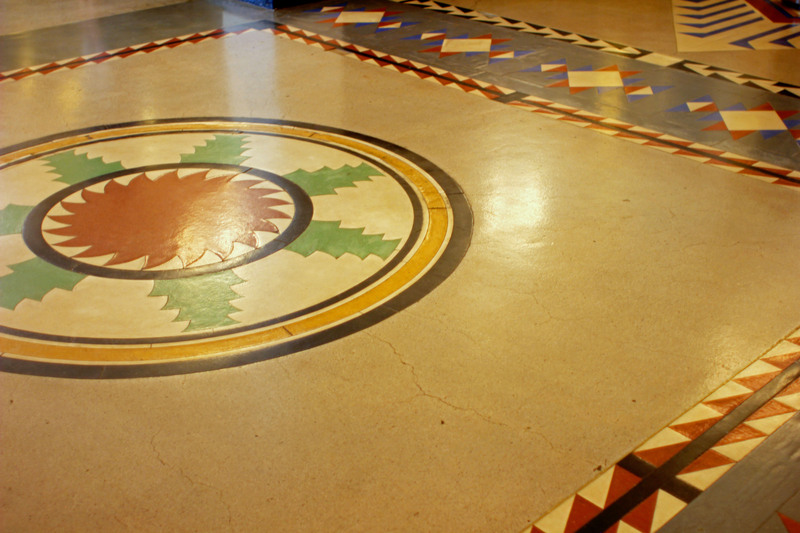 Floor mosaic at The Ahwahnee. Basket mural by Jeannette Dyer Spencer. Native American baskets on display in the Great Lounge at The Ahwahnee. Though not placed in the hotel as part of the original decor, the watercolor paintings of Gunnar Widforss now line the hallway from the registration lobby to the Dining Room and Great Lounge. 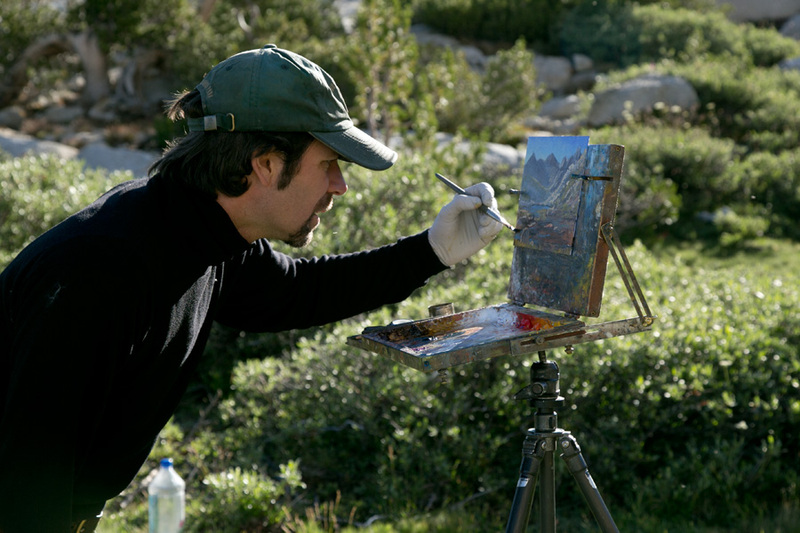 A Swedish artist who preferred painting landscapes such as the Grand Canyon was already famous by the time he arrived in Yosemite. 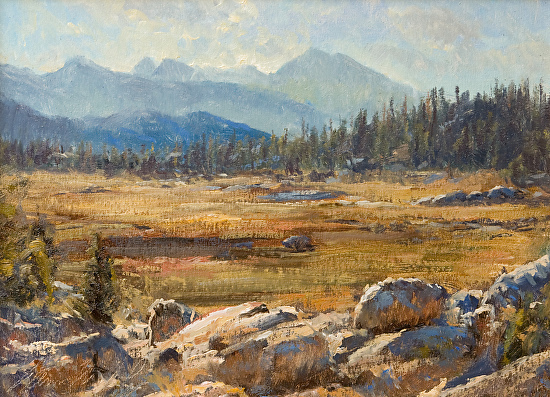 Widforss was contracted by the Yosemite Park and Curry Company to create paintings of Yosemite suitable for the grand scale of The Ahwahnee architecture and the landscape that surrounds it. 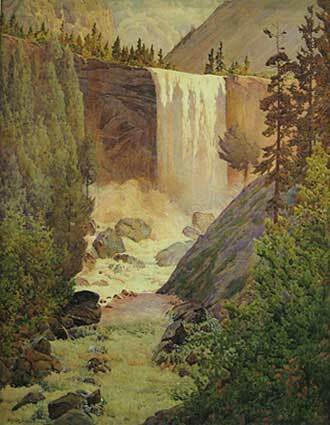 Vernal Fall by Gunnar Widforss. The Mural Room, once known as the Writing Room, features a toile pente (painted linen) mural on the wall created by Robert Boardman Howard for the hotel’s opening in 1927. 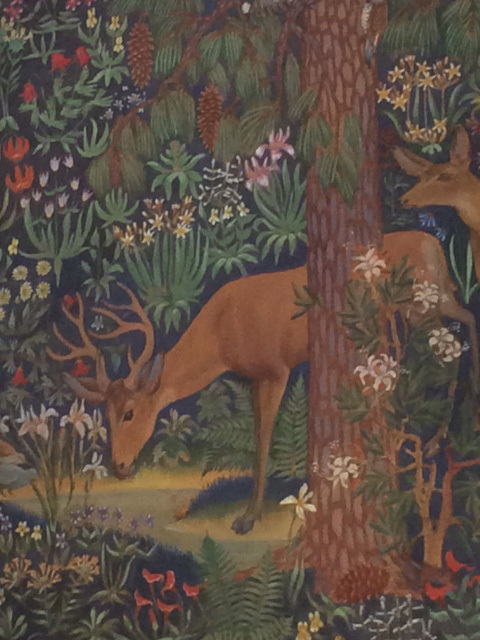 The fifteenth century style of the mural features the native flora and fauna of Yosemite National Park in a pattern of flowering plants with animals large and small, serving not only as historic decor, but also as a nature guide to Yosemite. 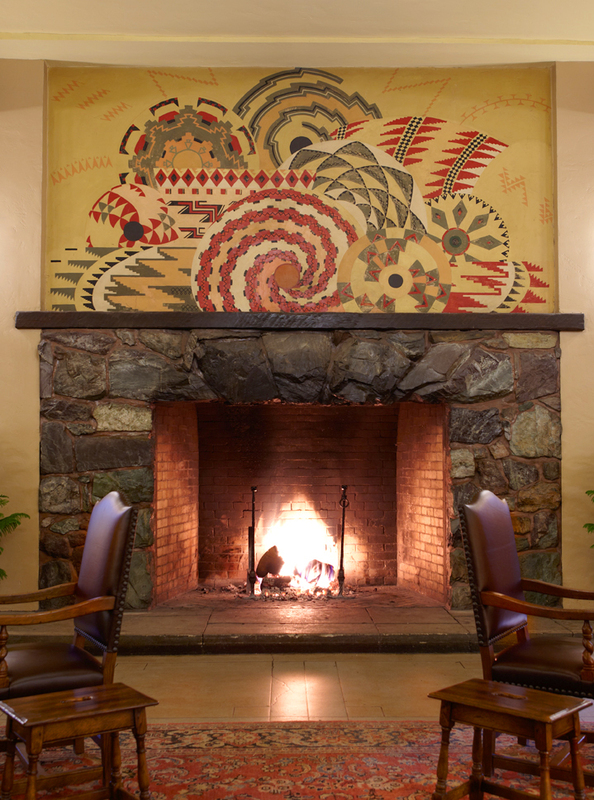 The Mural Room also features a unique corner fireplace with a hammered-copper hood and the only oak floor in the hotel’s public spaces. Detail of the mural by Robert Boardman Howard on the wall of the Mural Room. Though all of the decor delights park visitors in the public areas of the hotel, the most striking decorative element is the custom 5 x 6 foot stained glass panels that cap the ten floor-to-ceiling windows of the Great Lounge. Also designed by Jeannette Dyer Spencer, the stained glass panels were a last minute addition to hotel architect Gilbert Stanley Underwood’s original design. Though Spencer went on to contribute to the Ahwahnee decor in many areas, she was initially selected by Ackerman and Pope specifically for her background in stained glass design. 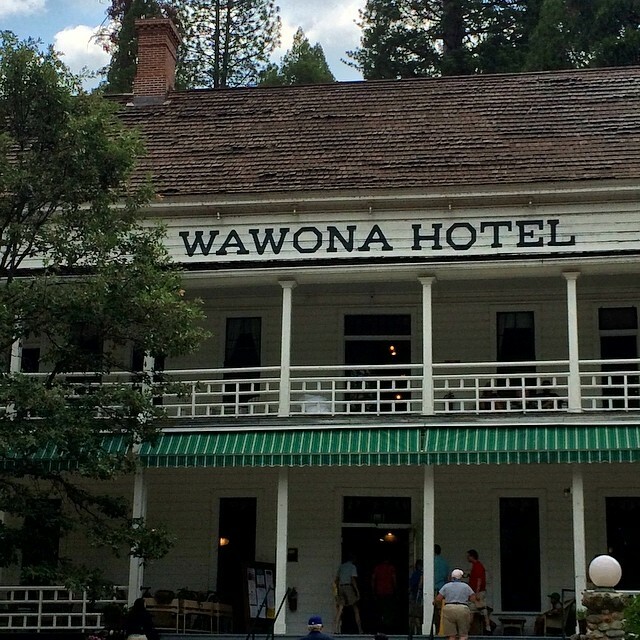 Her selection and design experience provided The Ahwahnee with one of its most enduring artistic elements. One of ten stained glass windows in the Great Lounge at The Ahwahnee.